Kim Chi poses with stage makeup students after her transformation. As part of Rainbow Week at LMU, the College of Communication and Fine Arts, in partnership with LGBT Student Services and the Department of Theatre Arts, invited famed drag queen and television star Kim Chi to campus to educate and entertain. 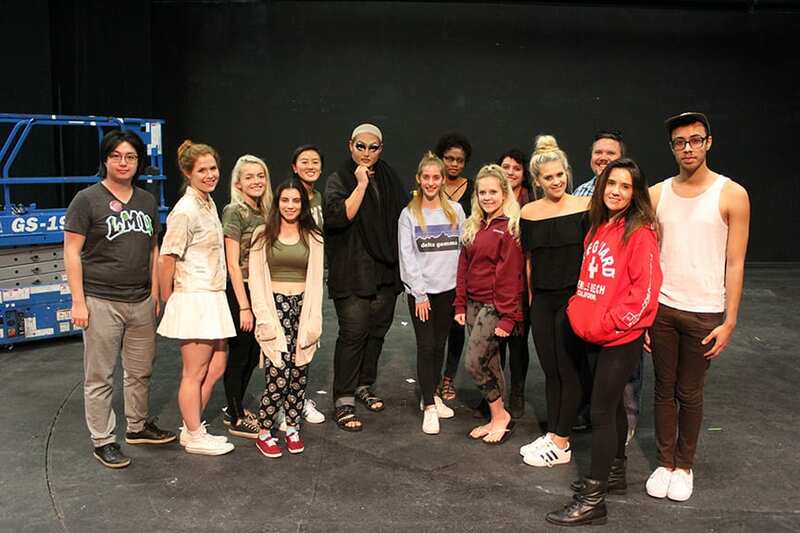 As a world-famous performer of gender identity, Kim was a guest lecturer for a day in the Department of Theatre Arts, speaking to the students enrolled in Beginning Stage Makeup, which was followed by an evening performance and Q&A session with students. Born in Korea and raised in Chicago, Kim is known for her makeup and fashion artistry, earning her the title of runner-up on season 8 of the television reality series RuPaul’s Drag Race. Kim came to drag relatively recently, starting off with a career as a graphic designer, before dressing up in drag one night out with friends in 2012 and “falling in love” with the concept. She draws inspiration from fashion shows and looks she sees on the runways and incorporates that into her performance costumes and looks. During the lecture, Kim answered questions from students on her process, origin, inspirations and even favorite anime characters. Kim did a full makeup application for the class, describing each step and choice as she proceeded. The hour and a half-long process was engaging and informative, and allowed students to see first-hand how a professional works. The end result was one of complete transformation, as Kim transformed from male to a glamorous female.